This article was written in response to requests for successful color combination tips. 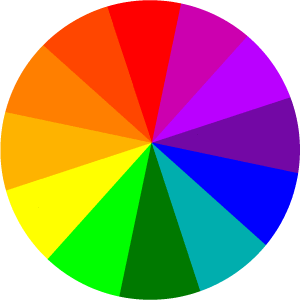 Let’s start with the color wheel which consists of primary colors (red, blue, yellow), secondary color (green, orange, violet), and tertiary colors (red-blue, blue-red, and so on). In essence, we’ve taken the full color spectrum and form them into a circle, showing the relationship of each color with one another. Before we look at the various ways to put color together, let’s also learn some commonly-seen terms. We recognize colors, or hues, may vary in their intensity. The primaries, secondaries, and tertiaries represent colors at their full intensity. Adding white will form a tint, black will create a shade, while gray will give you a tone. Thus, tinting will give color a lighter color while shading makes it darker. Let’s put the color wheel to work. The first type of combination uses complementary colors. That is, colors that lie opposite each other on the color wheel. For example, red and green. But wait, isn’t that combination a little too intense for a room? Yes, but consider a rosy pink room with sage green accents. This is when ‘tint’ and ‘shade’ comes into play. Looking at the 2 examples below, you can see how the same complements in varying intensities can make attractive, soothing combinations. Alternatively, consider the monochromatic color scheme, a favorite amongst contemporary interior designers. This involves using one color in a variety of intensities. That way, your room’s color scheme is sure to be harmonious. When developing a monochromatic scheme, lean toward several tints or several shades, but avoid too many contrasting values – that is, combinations of tints and shades. This will make the scheme appear uneven. A more complex palette would involve three or more colors, formed by three equidistant colors such as red/yellow/blue or green/purple/orange (see below). A split complement is composed of three colors, one primary or intermediate and two colors on either side of its opposite. To illustrate, instead of teaming purple with yellow, shift the mix to purple with orange-yellow and yellow-green. Lastly, consider also the tetrad, which is four color spread equally around the wheel, such as yellow/green/purple/red. If you think this color combination seem too much, remember that colors for interiors are rarely undiluted. Thus yellow might be cream, blue-purple, a dark eggplant; and orange-red, a muted terra-cotta or whisper-pale peach. I also came across this site that gives more in-depth color coordination tips. While it pertains to men’s fashion, the tips on color combination work just as well for home interior.